I’m kind of late to the party, but here’s my 2 cents. 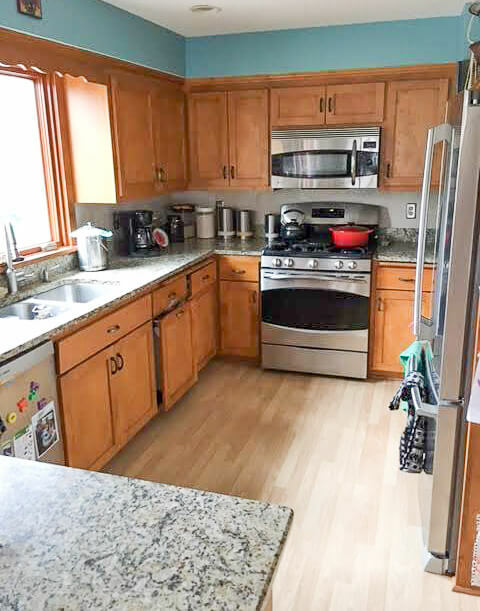 When I remodeled my 1961 kitchen, I was trying to take it back from the 80’s remodel the previous owners did. I wanted the mid century look without necessarily using period appropriate materials. I love the retro patterns found in formica, but wanted a solid surface countertop. I used quartz because there are several patterns that resemble terazzo. I am not planning to sell my house, but it would help for resale. And after 6 years, I have no regrets going with quartz. Please do not use tiles on the counter tops; they are notorious for germs and no matter how much you bleach or scrub, they are horrible. My brother-in-law inherited his parents house and his wife hates them. NOW. i love retro, but not all over the house. We are building a new smaller home and I am doing the kitchen in retro; I have Vintage Fiesta dishes, also canisters, and other things. Also, our children found a retro table/chairs with top gray and chairs were orange from not being protected from the sun, so we had them reupholstered in the original red. Beautiful. We have granite in our present home and I hate it, so we went to Quartz with a very light gray and white pattern. (we are on the marsh). I just wanted this one area retro as it reminds me of the early years of our marriage. So, if you have to work around what you have purchased, just look for retro decorations, but can tell you they are hard to find. I am hoping this kitchen will make a statement and yes, we have ordered all white appliances; we do not like stainless, reminds us of a hospital, too sterile and shows all fingerprints. Good Luck, but please take your time and do not make rash decisions of which you may later regret. For resale people want flexibility. They, too can change these three things to their liking without going broke. I took my new house’s kitchen and dining room back to the ’50s. The dining room is a replica of a diner–“Joe’s Diner.” I figure I don’t have to keep updating like everyone else. Instead, I downdated! If it looks old, that’s because it’s supposed to. My front entry/sun room is done in ’70s style. We call it “Joes Disco.” My home is aver y happy, peaceful and colorful place. The guy who installed the tile in the kitchen remarked “I hope you never plan on selling this place.” He disliked everything that much. Too bad for him. He was also a miserable and fearful person. I am thankful that my house has no vestige of his negative energy. Which leads to my thought on this. I am decorating for ME, not for some future, mythical, unknown buyer. My taste is good and as such, most people love my house, but if someone looking to buy it doesn’t agree, I say “too bad for hm or her.” Move on to the next house. People tell me my house should be in a magazine, and the guy who cleaned my carpet said it looks like something you’d see in “Better Homes and Gardens.” So there! And another thing: People who do work for us need to keep their negative opinions to themselves, and just do the work they were hired to do. Joe your comments are a welcome ray of sunshine. I inherited a 1956 midcentury modest bungalow with my sister. I would like to keep most of its original features, upgrade where necessary like electrical etc., and stage it in a midcentury style. Most real estate agents don’t get the midcentury thing and have suggested upgrades that are geared to the buyers.